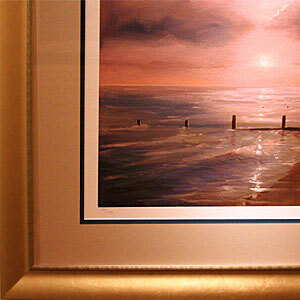 Ocean Galleries offers an endless number of possible framing combinations for you to choose from. Our expertise at selecting the perfect combination from this endless array of possibilities sets our custom framing apart from the rest. 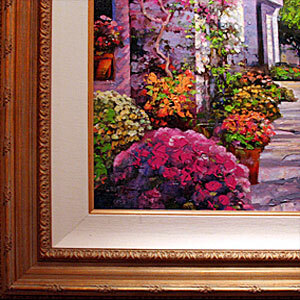 Listed below are just a few examples of custom framing solutions that Ocean Galleries can provide you with. For help with your specific custom framing needs, please call us at (609) 368-7777, or simply stop in either of our locations. 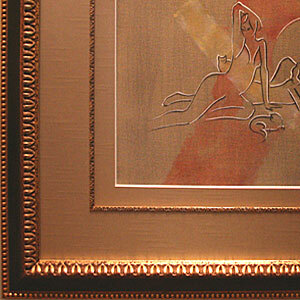 Our Custom Framing Specialists will be happy to assist you in choosing the perfect combination to accentuate your artwork. We carry a large selection of mat boards in stock and have the ability to create custom mat designs to match any challenging artwork layout. These thin frames sit inside the bevel of the mat board, providing a classy, finished appearance to the framing combination. We offer fabric-covered liners in a variety of types, including linen, silk and suede. This option is ideal for accentuating any artwork on canvas. Artwork with a finished or deckled edge benefits from being floated above a mat board. 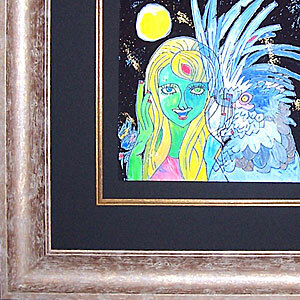 This method gives the artwork the appearance of hovering in the frame.